Many people tend to do other things like walking, reading or even cooking, when they are on their mobile phone. But does that mean you are not really concentrating on the conversation itself? Researchers have come up with a device that effectively shuts out the outside world, leaving you to focus on what you are saying. The Isophone is a gadget that blocks out all peripheral sensory stimulation and distraction, letting you talk in a quiet and calming environment. "The Isophone is a cross between a flotation tank and a telephone," said James Auger, who came up with the device, together with his colleague, Jimmy Loizeau. "The helmet is basically the telephone device. That fits over the user's head, and then it's attached to three floats that can be adjusted to provide the perfect floating position." The device is a Media Lab Europe project which goes against the grain of mobile development. It ignores novelties such as polyphonic ringtones and games and instead it is designed to help you concentrate on a phone call itself. "The Isophone itself is a helmet that cuts out all other sensory inputs for the wearer," said Mr Auger. "You can't hear anything else, you can't see anything else, you can't smell anything else, all you have coming in is the telephone call. 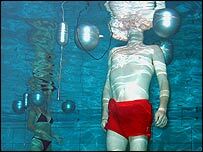 "You can't feel anything because you're basically floating around in water that's heated to body temperature, which removes the distraction of gravity, and allows the user's body to blur into the environment." Most developers are making phones smaller, and easier to use in any situation, so the Isophone is certainly different. But it seems some people will go to any lengths to get a good quality of conversation. "Whilst it's not necessarily very efficient, in many ways it's very pragmatic, in that the user will be totally focused on who they're talking to," said Mr Auger. "In a way it's a luxury item that allows for a really in-depth conversation. "So you can imagine your businessman who's abroad in Japan might be able to make a telephone call from the swimming pool to a loved one, or indeed to someone else involved in business, and have a really in-depth telephone call." In the past, telephone boxes have offered a small isolated space to make your call, and so with the Isophone we have come full circle. But there are some obvious practical problems. If you are making a business call, you will probably want to refer to your notes. 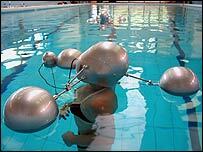 This is not an easy task if you are wearing a darkened helmet in a swimming pool. And whenever you want to make a call, you will need to have your Isophone with you, plus a heated swimming pool. We will have to see if the Isophone is worth the trouble. In the meantime it will just drift in a sea of ideas.